We need the real zombie hater. Are you one of them? Then take your gun and shoot! You are the the only one, who can cope with. So, there is no time to explain! 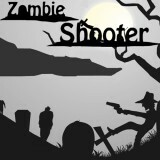 You must do it and save the whole planet from these terrible zombies! Good luck.